The Arthritis Foundation indicates that more than 50 million adults and 300,000 children living in the United States have some type of arthritis; in fact it is the leading cause of disability in America. Due to the prevalence of this diagnosis we as coders need to be surefooted when reporting it. 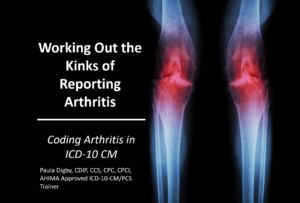 In ICD-10 accurately reporting arthritis can be difficult to say the least from the sometimes overwhelming details needed in documentation to accurately code the diagnosis to understanding the guidelines and all the confusion in between ; coding for arthritis in ICD-10 can be a real pain. Utilize learned information to make logical decisions regarding diagnosis coding for arthritis. Describe key ICD-10 CM and CMS rules and regulations specific reporting arthritis and apply this knowledge in your own facility.